Previously, we demonstrated that spontaneous TNF-α production by macrophages in rheumatoid arthritis (RA) synovial tissue is largely driven by contact-dependent activation with T cells in that tissue. Whereas abundant IL-10 is present in these RA synovial cultures, it does not adequately control the production of TNF-α. In this study, we have compared the mechanisms involved in IL-10–mediated TNF-α regulation in LPS-stimulated macrophages with macrophages stimulated with activated T cells. We confirm that in LPS-stimulated macrophages the 3′ enhancer region of tnf is essential for tnf transcription, and its regulation by IL-10 is dominated by a STAT3-dependent pathway. However, in contrast, we have found that tnf transcription in macrophages stimulated by activated T cells or by RA synovial T cells does not require the 3′ enhancer region of tnf, and that its regulation by IL-10 is subsequently altered and clearly is not mediated by a dominant STAT3 pathway. These observations have very important implications for our understanding as to how IL-10 regulates TNF-α production at sites of chronic inflammation, such as the synovial tissue of patients with RA. Furthermore, these distinct IL-10 mechanisms will have bearing upon the identification of potential therapeutic targets in RA synovial macrophages where the activation stimulus is clearly not LPS. The innate immune system is one of the earliest forms of defense against microbial infection and cellular damage. This system is initiated rapidly to effectively eradicate invading pathogens (and cellular debris) and terminated rapidly to minimize damage to cells of the host organism. However, in chronic inflammatory autoimmune disorders such as rheumatoid arthritis (RA), the inflammatory response appears to be dysregulated. The progression of RA disease is perpetuated by excessive production of proinflammatory cytokines like TNF-α, and a diminished response to anti-inflammatory cytokines such as IL-10. Research within our group identified TNF-α as a proinflammatory cytokine that plays a central role in the pathophysiology of RA (1–3), which was subsequently confirmed by clinical trials with anti-TNF modalities (4–10). Transcription of the TNF gene in human myeloid cells by LPS involves the NF-κB family of transcription factors, and at least four κB binding sites have been identified within the 5′ and 3′ untranslated regions (UTR) of the TNF-α gene (11). Research within our group has shown that spontaneous TNF-α production by RA synovial cultures is also dependent on NF-κB (12), and immunohistochemistry has revealed that both NF-κB p65 and NF-κB p50 are present within the nuclei of macrophages and cells lining RA synovial membrane tissues (13–15). However, LPS is not the signal that drives TNF-α production from RA macrophages. We have found that in established disease this is largely dependent upon interaction between the RA macrophages and the abundant T cells present in this tissue (16). Thus, depletion of CD3+ cells from RA synovial mononuclear cell cultures (MNCs) significantly abrogated the spontaneous production of TNF-α, and isolation and coculture of these CD3+ RA cells (without further activation) with resting blood monocytes induced cell contact-dependent TNF-α production from these resting cells (12). This chronic production of TNF-α within RA synovial joint tissue is largely insensitive to the immunomodulatory effects of the anti-inflammatory cytokine IL-10, with only modest inhibitory effects by exogenous IL-10 in RA MNCs on TNF-α levels (17). Thus, whereas IL-10 is present in abundance within RA synovial tissues, the IL-10 signaling pathways within the macrophage population of these cells appear to be dysfunctional. Analysis by microarray has revealed that IL-10 pretreatment of RA synovial macrophages compared with blood macrophages revealed that the number and strength of induction of genes induced by IL-10 in arthritic macrophages were markedly smaller than that induced in control macrophages, and furthermore, that IL-10 preferentially increased expression of IFN-γ–inducible genes in the RA macrophages. In contrast, arthritic macrophages expressed many IFN-γ–inducible genes prior to stimulation, and their response to IFN-γ remained mostly intact (18). This suggests that these macrophages have been preprogrammed to have a more proinflammatory phenotype than conventional blood-derived macrophages, and it is possible that T cells are involved in the preconditioning RA synovial macrophages (12, 16, 19). This current work investigates whether the mechanism(s) that IL-10 uses to regulate TNF-α production in macrophages by activated T cells is distinct from those that control LPS-induced macrophage TNF-α. We confirm that IL-10–induced regulation of TNF-α by LPS-stimulated macrophages is predominantly STAT3 mediated. However, in contrast, we make the novel observation that TNF-α production by human macrophages cocultured with autologous anti-CD3–activated T cells (hereafter Ttcr) or synovial rheumatoid T cells is refractory to inhibition by IL-10. This lack of responsiveness to IL-10 by macrophages cocultured with Ttcrs occurs due to weak activation of the downstream enhancer region of the TNF-α gene and attenuated transcriptional efficacy of STAT3. These findings provide an insight into the mechanisms responsible for the skewed proinflammatory cytokine profile seen in chronic inflammatory autoimmune diseases such as RA. Recombinant human IL-10, M-CSF, and IFN-γ were purchased from Peprotech (London, U.K.). LPS (serotype EH100 [Ra]) were obtained from Alexis Biochemicals. Human IL-10 neutralizing Ab (clone 25209) was purchased from R&D Systems, and corresponding isotype control Abs were purchased from BD Pharmingen (Oxford, U.K.). IFN-γ receptor-blocking Ab, 10 μg/ml (clone 166-5), was a gift of D. Novick (Weizmann Institute). Phospho-STAT1 (Tyr701), phosphor-STAT3 (Tyr705), and NF-κB p65 Abs used for intracellular FACS were purchased from BD Pharmingen. Paired Abs against human TNF-α, IFN-γ, and IL-10 for ELISA were purchased from BD Pharmingen. Anti-CD3 Ab (clone OKT3) used to activate PBLs was purchased from eBiosciences (Cambridge, U.K.). Cells were cultured in RPMI 1640 (PAA) supplemented with 5% FCS (Biosera). All reagents had <0.1 U/ml endotoxin, measured by Limulus amebocyte lysate assay (BioWhittaker, Walkersville, MD). One-step reverse-transcription TaqMan real-time PCR reagents were obtained from Eurogentech, and primer probes were purchased from Applied Biosystems. Human PBLs and monocytes were enriched from single-donor platelet-depleted buffy coats or apheresis cones purchased from the North London Blood Transfusion Service (Colindale, U.K.) by centrifugal elutriation, as described previously (12). PBLs and monocytes obtained by this method were routinely collected at >80% purity. Synovial membranes were obtained from patients undergoing elective joint replacement procedures. All procedures received local ethics committee approval (Riverside Research Ethics Committee, 1752). RA tissue was obtained from patients fulfilling the American College of Rheumatology criteria for RA. Single-cell suspensions were prepared by mechanical and enzymatic disruption, as previously described (1, 2). Mononuclear cells were obtained from synovial tissue specimens taken during joint replacement surgery, provided by the Orthopedic/Plastic Surgery Department of Charing Cross Hospital (London, U.K.) and the South West London Elective Orthopedic Centre at Epsom Hospital, as previously described (1, 2). CD3+ T cells were positively selected using Dynabeads FlowComp Human CD3 isolation kit protocol (Invitrogen Dynal AS, Oslo, Norway) and the manufacturer’s protocol. CD3+ rheumatoid T cells obtained by this method were routinely >80% pure. CD3+ rheumatoid T cells were fixed with 0.01% glutaldehyde, as described previously (19), before coculture with macrophages. PBLs were activated by 5 μg/ml plate-bound anti-CD3 Ab (OKT3) for 48 h. Activated PBLs (hereafter are referred to as Ttcrs) were cocultured with autologous M-CSF–differentiated monocytes (5–8 d) at specified cell/cell ratios. To neutralize the bioactivity of IL-10 or IFN-γ, anti–IL-10 Ab (10 μg/ml), anti–IFN-γ receptor Ab (10 μg/ml), and their corresponding isotype controls (mouse IgG1, 10 μg/ml) were titrated into cultures, as indicated in supplemental data described in Supplemental Figs. 3 and 4. Monocytes were differentiated with 100 ng/ml M-CSF in RPMI 1640 supplemented with 5% FCS for 5–8 d. M-CSF–derived macrophages were then plated at a density of 1 × 106/ml in the appropriate cell culture plate at least 1 d prior to stimulation with 10 ng/ml LPS, coculture with activated T cells (Ttcrs), or fixed CD3+ rheumatoid T cells (at cell/cell ratio specified). M-CSF–differentiated macrophages or rheumatoid synovial cells were transfected with adenovirus, as described previously (20). Twenty-four hours later, the cells were stimulated with LPS (10 ng/ml) and cocultured with Ttcrs or CD3+ rheumatoid T cells. For data described in Supplemental Fig. 2, M-CSF macrophages were transfected with either mutated STAT3, Adv217, or Adv47. M-CSF–differentiated macrophages were harvested on day 3 and washed in phenol red-free RPMI 1640. Endogenous STAT3 was knocked down using the 200 nM small interfering RNA (siRNA) oligo in conjunction with Amaxa manufacturer’s protocol (as was described previously) (21). The siRNA sequence for STAT3 is 5′-GGAUGACUUUGAUUUCAAC-3′, and it was purchased from Ambion. The scrambled oligo control was purchased from Ambion (Silencer Negative Control siRNA 1; catalog AM4611). After electroporation, the cells were incubated for 24 h; the media was then replaced and left for an additional 48 h prior to stimulation with LPS or coculture with Ttcrs. Cells infected with adenoviral-based luciferase reporter genes were harvested at indicated times, and luciferase reporter assays were performed, as described previously (22). Luciferase activity was measured in triplicate using a luminometer after the addition of 30 μl luciferin (Bright-Glo luciferase assay system; Promega) per well. Levels of luciferase activity were converted into fold inductions using the basal luciferase activity of unstimulated macrophages. Supplemental data described in Supplemental Fig. 1 were determined after RNA was extracted from macrophages stimulated with LPS or activated T cells at times indicated in Supplemental Fig. 1 using the blood RNA extraction kit (Qiagen). The PCR was performed using assay-on-demand premixed probes (Applied Biosystems) and the Superscript III one-step RT-PCR kit with platinum Taq (Invitrogen). The reaction was measured by Corbett Rotor-Gene 6000. The relative gene expression was calculated using the δ cycle threshold method with the GAPDH gene to normalize RNA levels. The data were presented as a fold induction of normalized TNF-α mRNA at various times compared with normalize TNF-α mRNA at time zero. These supplemental data are illustrated in Supplemental Fig. 1. 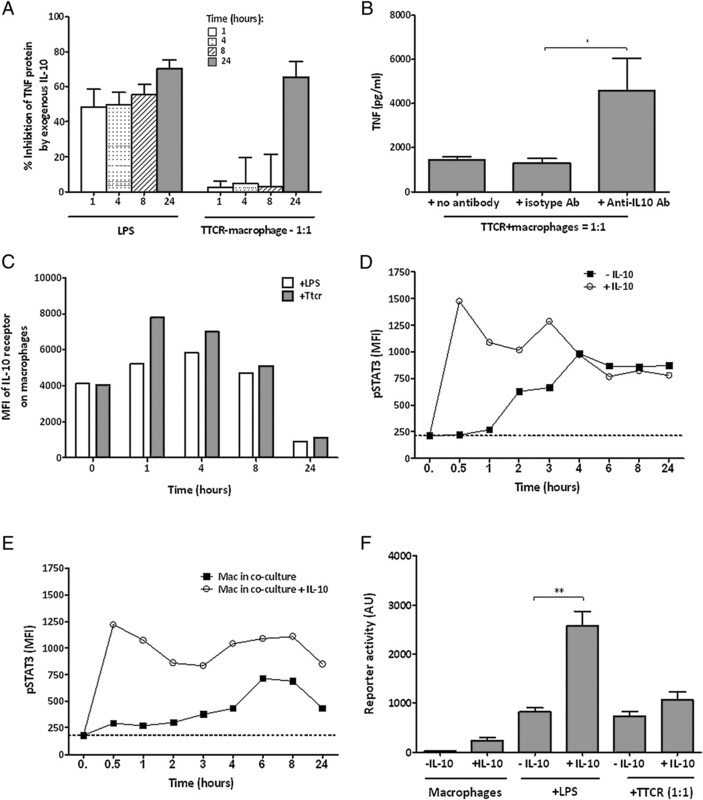 M-CSF–stimulated macrophages were stimulated with either LPS or activated T cells, and, after 2, 4, and 6 h, actinomycin D (1 μg/ml) was added, followed by 1 μM SB202190 or DMSO. Cultures were harvested at 1, 15, 30, 45, 60, and 120 min, and the presence of TNF-α mRNA was measured using real-time PCR and normalized against GAPDH; levels of TNF-α mRNA were expressed as a fraction of the TNF-α mRNA levels at time zero. The t1/2 of mRNA decay was calculated using the one-phase exponential decay equation model using Prism GraphPad software. Sandwich ELISAs were performed to detect cytokines in supernatants harvested at indicated times following the BD Pharmingen manufacturer’s protocol. The activation of STAT1, STAT3, and NF-κB p65 was determined using BD Phosflow protocol III. Briefly, cells were stained with CD14-FITC before fixation with BD Phosflow Lyse/Fix buffer and permeabilized with Perm Buffer III (alcohol based). Abs were used at the recommended concentration in TBS buffer. A total of 20,000 events was routinely collected using a FACSCanto flow cytometer (BD Biosciences), and data were analyzed using the program FlowJo. Macrophages were identified as CD14+ cells in live gate. Cell pellets were lysed in 1% Nonidet P-40 lysis buffer (50 mM Tris [pH 7.6], 150 mM NaCl, 2 mM EDTA), supplemented with 500 μM sodium fluoride, 1 mM sodium vanadate, and protease inhibitor mixture I (Sigma-Aldrich, Dorset, U.K.). Cell extracts were resolved by SDS-PAGE and transferred to polyvinyl difluoride membranes (Millipore), which were blocked for 1 h with blocking buffer (5% w/v fat-free milk, 0.1% v/v Tween 20 in PBS), followed by 1-h incubation with the Abs, and diluted 1:1000 in blocking buffer. Anti-IκB (Santa Cruz Biotechnology) or β-tubulin (Sigma-Aldrich). HRP-conjugated anti-mouse IgG or anti-rabbit IgG (GE Healthcare) were used as secondary Abs at a dilution of 1:2000. Bound Ab was detected using the ECL kit (GE Healthcare) and visualized using Hyperfilm MP (GE Healthcare). Results were analyzed using Prism 4 software (GraphPad). Kolmogorv-Smirnov column statistics were performed on data to determine whether it followed a Gaussian distribution. Normally distributed data were analyzed using a paired t test. Data that are not normally distributed were analyzed using a Wilcoxon matched pair test. Stimulation of human macrophages with LPS (10 ng/ml) in vitro rapidly induced the production of TNF-α. TNF-α protein was detected in supernatants 1 h after stimulation, peaked between 4 and 8 h, and then began to decline (Fig. 1A). In part, the reduction in TNF-α protein was due to the synthesis and release of the anti-inflammatory cytokine, IL-10 (Fig. 1B) (22, 23). Unlike LPS stimulation, coculture of macrophages with autologous anti-CD3–activated human peripheral blood T cells (Ttcrs) resulted in a gradual increase in TNF-α protein (Fig. 1C), which did not decline after 24 h. This continual increase was not due to a lack of IL-10 production, as IL-10 was detected 8 h after initiation of cocultures, albeit at much lower levels (Fig. 1D). It was postulated that the prolonged production of TNF-α by T cell/macrophage cocultures may be due to inherent differences in the transcription of TNF mRNA. Stimulation of human macrophages with LPS induced TNF-α mRNA accumulation, which was detectable after 30 min, peaking 120 min after stimulation, with 1500-fold induction, before returning to near baseline levels 240 min later (Supplemental Fig. 1A). Coculture of macrophages with activated T cells caused a more prolonged increase and lower fold increase in TNF mRNAα accumulation, which peaked between 240 min, with 12-fold increase, before decreasing (Supplemental Fig. 1B). To determine whether an increase in stability of TNF-α mRNA could account for the sustained TNF-α production observed in T cell/macrophage cocultures, an actinomycin D chase was performed (Supplemental Fig. 1C–E). TNF-α mRNA produced by macrophages stimulated with LPS for 2 or 4 h (54 and 51 min, respectively) degraded with a similar t1/2, to TNF-α mRNA produced by T cell/macrophage cocultures (51 and 52 min, respectively). These data suggest that the prolonged TNF-α production observed in T-cell/macrophage cocultures is not due to a difference in TNF-α mRNA stability. The kinetics of TNF-α and IL-10 production by LPS-stimulated macrophages and macrophages cocultured with Ttcrs. M-CSF–differentiated human macrophages were stimulated with 10 ng/ml LPS (A, B) or cocultured with Ttcrs at a ratio of 1:1 (T cell/macrophage) (C, D). TNF-α (A, C) and IL-10 (B, D) were measured by ELISA in the culture supernatants harvested at times indicated. A, TNF-α production by LPS-stimulated human macrophages. B, IL-10 production by LPS-stimulated human macrophages. C, TNF-α production by human macrophages cocultured with Ttcrs. D, IL-10 production by human macrophages cocultured with Ttcrs. Graphs are means (± SEM) from five different donors, and each experiment was performed in triplicate. To determine whether macrophages are the main producer of TNF-α in T cell/macrophage cocultures, macrophages were transfected with a TNF-α promoter-driven luciferase reporter gene using an adenoviral delivery system. The dynamics of TNF-α protein produced were mirrored by the luciferase activity in either LPS- or T cell-stimulated macrophages (Fig. 2A, 2B), indicating that the macrophages were the primary producers of TNF-α within the T cell/macrophage cocultures. TNF-α transcription is weakly dependent on the downstream TNF-α enhancer region in T cell/macrophage cocultures. M-CSF–differentiated human macrophages were transfected with a TNF-α luciferase reporter adenovirus at multiplicity of infection of 100:1 before being stimulated with 10 ng/ml LPS or with Ttcr (3:1 ratio). TNF-α production (A) and luciferase reporter activity (B) were measured at times indicated. C, A scheme diagram of wild-type and truncated TNF-α reporter gene constructs. 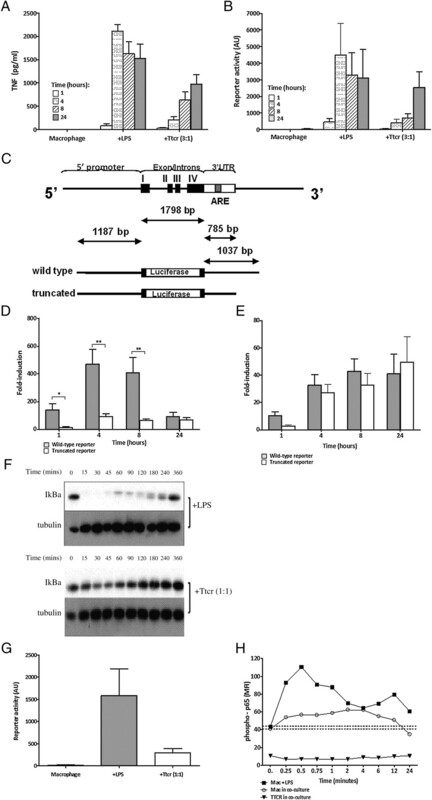 TNF-α reporter activity induced by LPS (D) or Ttcr cocultures (E) in macrophages transfected with either a wild-type TNF-α reporter adenovirus or a TNF-α reporter lacking the 3′-UTR NF-κB binding site (truncated adenovirus). *p < 0.05, **p < 0.01. These graphs are mean (± SEM) of six different donors, and each experiment was performed in triplicates. F, Western blots of Iκβα degradation in macrophages stimulated with LPS or Ttcr in a time-dependent manner. G, NF-κB luciferase activity in macrophages stimulated with either LPS or Ttcr 1:1. H, FACS analysis of phosphorylation of p65 in macrophages stimulated with either LPS or Ttcr. These data are a representative of five different donors. To ascertain why there were different kinetics in TNF-α protein between LPS-stimulated macrophages and macrophages cocultured with Ttcrs, we determined which regions of the TNF-α gene were activated in both systems. The human TNF-α gene contains multiple κB binding sites; the cluster of κB binding sites within the 5′ region of the gene are referred to as the κB site 1, κB site 3, and κB site 2 cluster. In addition to these upstream κB binding sites, an evolutionarily conserved enhancer region is present within the downstream of the human TNF-α gene (24). This 3′-UTR contains a multitude of different potential transcription factor binding sites, including a κB binding site that is required for enhanced transcription of TNF-α by human macrophages stimulated with LPS (24) and required by IL-10 for efficient inhibition of TNF-α transcription (25). To determine the importance of this enhancer region in the transcription of TNF-α by the cocultures, macrophages were transfected with a wild-type TNF-α reporter gene construct (which contains the 5′ region, the 3′-UTR, and the downstream enhancer region) or a truncated TNF-α reporter gene construct (which contains the 5′ region and the 3′-UTR, but lacks the downstream enhancer region) (Fig. 2C) prior to stimulation with LPS or coculture with Ttcrs. LPS-stimulated macrophages expressing the truncated TNF-α reporter gene construct generated significantly less luciferase reporter activity at the 1-, 4-, and 8-h time points than LPS-stimulated macrophages expressing the wild-type TNF-α reporter gene construct (Fig. 2D). These findings confirm previously published data (25). However, when macrophages were cocultured with Ttcrs, the wild-type TNF-α reporter gene construct only generated significantly greater levels of luciferase reporter activity than the truncated reporter at the 1-h time point. At the 4-, 8-, and 24-h cocultures, there was no difference in the magnitude of reporter gene activity between the wild-type and truncated reporter gene constructs (Fig. 2E). These findings suggest that the downstream enhancer region of tnf is not required for the transcription of TNF-α in macrophages cocultured with activated T cells. The weak early dependence on the enhancer region in T cell/macrophage cocultures for TNF-α transcription prompted us to look at the activation of NF-κB. Western blots performed on T cell/macrophage cocultures over time show that mild degradation of IκBα occurs, albeit with more transient kinetics than LPS-stimulated macrophages (Fig. 2F). Transfection of macrophages with a reporter gene construct that contains four consensus κB binding sites upstream of a luciferase reporter gene generated significantly greater reporter gene activity in macrophages stimulated with LPS compared with macrophages cocultured with Ttcrs (Fig. 2G). This was corroborated by the intracellular phosphoserine 536 FACS staining of p65. Transient activation of p65 in LPS-stimulated macrophages peaked at 30 min and lasted for 2 h. In contrast, a weaker, but more prolonged activation of p65, of up to 12 h, was detected in T cell/macrophage cocultures (Fig. 2H). These findings suggest that NF-κB p65 is activated, but differentially regulated in macrophages cocultured with autologous Ttcrs compared with those activated with LPS. Previous studies within our group have shown that exogenous IL-10 inhibits the transcription of TNF-α by inhibiting the recruitment of NF-κB p65 to the TNF-α gene (25). Interestingly, the 3′ enhancer region of TNF-α contains a κB site, which may play a role in mediating the inhibitory effects of IL-10 on TNF-α transcription in LPS-stimulated macrophages in addition to playing a role in the transcription of TNF-α. With the knowledge that NF-κB p65 is weakly activated in macrophages cocultured with Ttcrs and that the enhancer region is not used after 1 h of coculture, we decided to determine the efficacy with which exogenous IL-10 (10 ng/ml) inhibits TNF-α produced by T cell/macrophage cocultures. Macrophages simultaneously stimulated with exogenous IL-10 and LPS produced 48 ± 10%, 49 ± 7%, 55 ± 6%, and 70 ± 5% less TNF-α protein than macrophages stimulated with LPS alone for 1, 4, 8, and 24 h, respectively (Fig. 3A). However, exogenous IL-10 failed to inhibit the production of TNF-α protein generated in supernatants harvested after 1-, 4-, or 8-h cocultures when added simultaneously to macrophages with autologous Ttcrs except at the 24-h time point (Fig. 3A). TNF-α production is refractory to exogenous IL-10 inhibition, and STAT3 transcriptional activity is attenuated within 8 h of T cell/macrophage cocultures. M-CSF–differentiated human macrophages were stimulated with either 10 ng/ml LPS or Ttcr at 1:1 cell ratio in the presence or absence of 10 ng/ml IL-10. A, Inhibition of TNF-α production in LPS or Ttcr stimulates macrophages by exogenous IL-10 at 1, 4, 8, and 24 h after stimulation. Result is presented as percentage of inhibition of TNF-α with respect to its levels produced in the absence of IL-10 at the same time point. The graph is presented as mean ± SEM of five different donors. B, TNF-α production in T cell/macrophage cocultures at 24 h after neutralization of endogenous IL-10 activity. *p < 0.05. The graph is presented as mean ± SEM of five different donors. C, FACS analysis of IL-10R expression level on CD14+ macrophages over 24 h in LPS- or Ttcr-stimulated macrophages. The result is presented as mean fluorescence index and is a representative of three different donors. D and E, FACS analysis of STAT3 activation (phosphorylation of Tyr705) in macrophages stimulated with either LPS (D) or Ttcr (E) in the presence or absence of IL-10. The graphs are a representative of four different donors. F, STAT3 reporter activity in macrophages stimulated with LPS (**p < 0.01) or Ttcr ± IL-10. The data are presented as mean ± SEM of three different donors. To determine whether exogenous IL-10 affected the TNF-α mRNA, TaqMan RT-PCR was performed. Stimulation of macrophages with IL-10 and LPS for 2 h resulted in a 57 ± 18% reduction in TNF-α message compared with macrophages stimulated with LPS alone (Supplemental Fig. 1F). TNF-α message generated by macrophages cocultured with Ttcrs was not inhibited by the addition of exogenous IL-10; indeed, TNF-α transcript was enhanced by 53 ± 14% in response to IL-10 (Supplemental Fig. 1F). These data suggest that exogenous IL-10 is unable to directly inhibit TNF-α at both the protein and mRNA level in T cell/macrophage cocultures at these early time points. However, endogenous IL-10 is produced by macrophages cocultured with Ttcrs at the 24-h time point (Fig. 1D), and, when neutralized with a mAb, TNF-α production was significantly increased (p < 0.05), indicating that the endogenous IL-10 is biologically active (Fig. 3B). The inability of exogenous IL-10 to attenuate TNF-α produced by T cell/macrophage cocultures between 1 and 8 h was not attributed to a downregulation of cell surface IL-10R expression, as the expression of this receptor on CD14+ macrophages stimulated with other LPS or with activated Ttcrs was similar in the two culture conditions, with an increase after 1 h in culture and reduction by 24 h staying higher for 8 h (Fig. 3C). IL-10 is known to mediate its anti-inflammatory effects by activation of the transcription factor STAT3 (26–28). Both Tyr705 and Ser727 can be activated to facilitate the formation of homodimers, nuclear translocation, and DNA binding. However, experiments on human macrophages using theSTAT3 luciferase reporter system [as previously described (29)] demonstrated that Tyr705, and not Ser727, plays a role in IL-10–induced STAT3 transcriptional activity (Supplemental Fig. 2). For this reason, the Tyr705 phosphorylation of STAT3 was determined in macrophages stimulated with LPS or cocultured with Ttcrs in the presence and absence of exogenous IL-10 using intracellular FACS staining. Stimulation of macrophages with LPS alone caused a steady increase in phospho-STAT3 that plateaued 4 h after activation (Fig. 3D). In contrast, in macrophages cocultured with Ttcrs (Fig. 3E), phosphorylation of STAT3 peaked at 6 h and then decreased after 8 h. In the presence of exogenous IL-10, stimulation of macrophages with LPS generated a profound increase in phospho-STAT3 within the first 4 h; beyond this time point, phospho-STAT3 levels declined to levels that were identical to those found in macrophages that had been stimulated with LPS alone (Fig. 3D). In the TCR-macrophage cocultures, a profound increase in phospho-STAT3 was also observed in the presence of exogenous IL-10 (Fig. 3E), which was sustained for 24 h. This suggests that, despite the inability of exogenous IL-10 to inhibit TNF-α production during the first 8 h of T cell/macrophage coculture (Fig. 3A), it was still able to induce the phosphorylation of STAT3 in these macrophages. However, it is possible that phosphorylation of STAT3 on Tyr705 was not sufficient enough to fully activate its transcriptional activity. Therefore, we decided to determine during the early phase of stimulation (4 h) whether exogenous IL-10 induced active and functional STAT3 using the adenoviral expressed STAT3 reporter gene. Stimulation of macrophages with LPS alone for 4 h caused an increase in STAT3 reporter gene activity, which was synergistically enhanced in the presence of exogenous IL-10 (Fig. 3F). 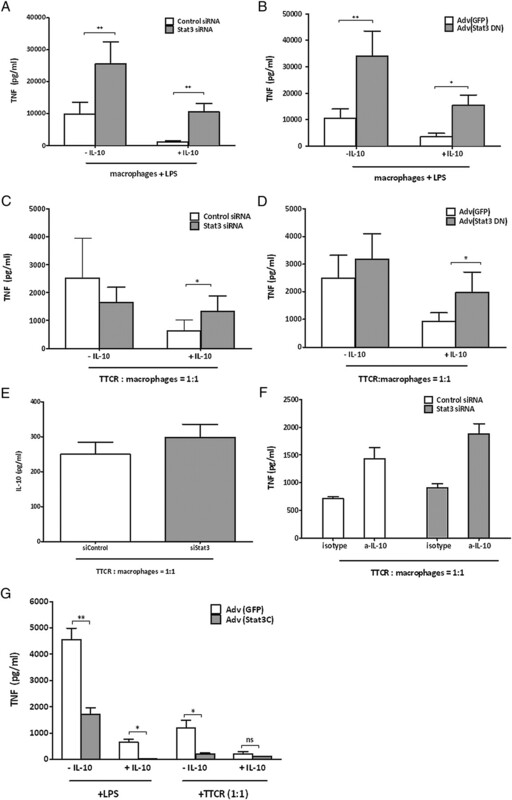 Coculture of macrophages with Ttcr cells for 4 h induced STAT3 reporter gene activity; however, exogenous IL-10 failed to synergistically enhance its activity (Fig. 3F). Although STAT3-dependent transcription could not be enhanced by IL-10 in coculture of macrophages and Ttcr cells at 4 h (Fig. 3F), exogenous IL-10 inhibited TNF-α production at 24 h (Fig. 3A). Therefore, we examined the involvement of STAT3 in inhibiting late-phase (actually 24-h) production of TNF-α in T cell/macrophage cocultures (when endogenous IL-10 was produced; Fig. 1D). The expression of STAT3 in macrophages was suppressed using siRNA, and resulted in a significant increase in TNF-α production by macrophages stimulated with LPS in the absence of exogenous IL-10 (Fig. 4A). In addition, exogenous IL-10 strongly suppressed TNF-α production in LPS-treated control macrophages (open bars in Fig. 4A), confirming IL-10–mediated inhibition of TNF-α is a STAT3-dependent process (30). Interestingly, the superinduction of TNF-α in STAT3-depleted LPS-stimulated macrophages could also be suppressed by exogenous IL-10 (Fig. 4A). This could be due to activation of a STAT3-independent pathway by exogenous IL-10 in STAT3-depleted macrophages or residual STAT3 activity in the siRNA-treated cells. A similar result was confirmed using macrophages transfected with an adenoviral vector encoding a dominant-negative form of STAT3 [Adv (STAT3 DN)] (Fig. 4B), which is consistent with our previous data (29). Regulation of TNF-α production in T cell/macrophage cocultures is independent of STAT3 activity. A, TNF-α production by STAT3-depleted human macrophages stimulated with LPS. **p < 0.01. B, TNF-α production by macrophages transfected with an adenovirus encoding STAT3 DN gene upon LPS stimulation. *p < 0.05, **p < 0.01. C, TNF-α production by STAT3-depleted macrophages stimulated with Ttcr at 1:1 ratio. *p < 0.05. D, TNF-α production by macrophages transfected with Adv (STAT3 DN) when activated by Ttcr at 1:1 ratio. *p < 0.05. E, IL-10 production by control or STAT3-depleted macrophages in cocultures. F, TNF-α production by STAT3-depleted macrophages after neutralization of IL-10 in cocultures. G, TNF-α production by macrophages expressing Adv (STAT3C) activated either by LPS or Ttcr cells. *p < 0.05, **p < 0.01, ns not significant. Data (A–D, F) presented are mean ± SEM of at least six different donors, and experiments were carried out in triplicates. Data (E, F) are representative of three different donors. Contrary to TNF-α production by LPS-stimulated macrophages, knockdown of STAT3 expression did not increase TNF-α production by macrophages upon stimulation with Ttcr 1:1 illustrated in Fig. 4C and was also observed with T cell/macrophage coculture ratios ranging from 1:1 to 7:1 (data not shown). The lack of STAT3 dependency of TNF-α regulation was also confirmed by the failure of Adv (STAT3 DN) to further increase TNF-α production in T cell/macrophage cocultures (Fig. 4D). Nonetheless, IL-10 is produced by these cocultures (Fig. 4E), and, when neutralized with an anti–IL-10 Ab, a significant increase in TNF-α production is observed in both control macrophages and STAT3-depleted macrophages (Fig. 4F). This result strongly suggests that IL-10 activates a STAT3-independent pathway to inhibit the production of TNF-α in T cell/macrophage cocultures. However, in these activated T cell macrophage si-control cocultures, that exogenous IL-10 could inhibit TNF-α production (Fig. 4C) was reversed when STAT3 expression was knocked down by siRNA STAT3. These data strongly suggest that exogenous IL-10–mediated TNF-α inhibition occurs through a STAT3-dependent mechanism and was further confirmed by the use of Adv (STAT3 DN) (Fig. 4D). It appears thus that STAT3-dependent IL-10 regulation can be triggered in the presence of surplus amounts of exogenous IL-10 and that this STAT3 pathway is not compromised in Ttcr-activated macrophages. Interestingly, in T cell/macrophage cocultures, with ratios ranging from 1:1 to 7:1, exogenous IL-10 was only capable of inhibiting TNF-α production by 1:1 cocultures (Supplemental Fig. 3A). This cell density dependence was also observed (Supplemental Fig. 3B) when endogenous IL-10 was neutralized using anti–IL-10 Abs, suggesting that at higher ratios other factors can overcome IL-10–induced suppression. Supplemental Fig. 3C shows that whereas increasing T cell/macrophage ratios did lead to increased IL-10 production, one would not expect this small increase to saturate the system, making the cells refractory to addition of exogenous IL-10. Therefore, it appears that the STAT3 pathway was not efficiently activated in T cell/macrophage cocultures, but when surplus amounts of exogenous IL-10 were present (as indicated in Fig. 3E, 3F), the STAT3 pathway was required. Thus, macrophages were transfected with an adenovirus encoding a constitutively active form of STAT3 [Adv(STAT3C)]. This mutant is constitutively active as a result of substituting the cysteine residues for C661A and C663N, allowing ligand-independent STAT3 dimerization and activation. As expected, TNF-α production was significantly attenuated upon either LPS or Ttcr stimulation when macrophages expressed the constitutively active form of STAT3 (Fig. 4G). Previous studies in our group have shown that spontaneous TNF-α production in RA synovial MNCs is largely T cell dependent (12), and, as we had demonstrated that IL-10–mediated TNF-α suppression, by endogenous IL-10, was independent of STAT3 activity in T cell/macrophage cocultures, we went on to investigate whether TNF-α production in macrophages stimulated with RA synovial T cells was also STAT3 independent. Hence, CD3+ lymphocytes were isolated from RA synovial tissue and cocultured with macrophages transfected with Adv(STAT3 DN). Expression of a dominant-negative form of STAT3 did not affect TNF-α production in RA T cell/macrophage cocultures (Fig. 5A). As endogenous IL-10 was also produced in these cocultures (Fig. 5B), this suggests that regulation of TNF-α by IL-10 occurred through a STAT3-independent mechanism. Regulation of TNF-α production in RA synovial tissue MNCs is independent of STAT3 activity. TNF-α (A) and IL-10 (B) production by macrophages expressing Adv (STAT3 DN) cocultured with CD3+ rheumatoid T cells at 3:1 ratio. Data presented are mean ± SEM of three donors, and experiments were carried out in triplicates. C, Percentage of TNF-α production by Adv (STAT3 DN)- and Adv (STAT3C)-transfected rheumatoid synovial tissue MNC and by exogenous IL-10 compared with cultures transfected with Adv (GFP). Data presented are mean ± SEM of six different donors, and experiments were carried out in triplicates. To determine whether the above findings are applicable in a pathophysiological setting, RA synovial tissue MNCs were transfected with adenoviruses expressing GFP (control), Adv (STAT3 DN), or Adv (STAT3C). Similar to the observation with T cell/macrophage or RA T cell/macrophage cocultures, overexpression of STAT3 DN did not significantly augment spontaneous TNF-α production (Fig. 5C) in contrast to the very significant augmentation of TNF in LPS-stimulated Adv (STAT3 DN) macrophages (Fig. 4B). In addition, spontaneous TNF-α production was inhibited by overexpression of STAT3C (52 ± 11%) as well as by exogenous IL-10 (77 ± 11%), indicating that the STAT3 pathway can be artificially activated to regulate TNF-α, but that, in these pathological RA MNCs, the default regulation of TNF is not STAT3 dependent. Anti-inflammatory responses are a series of tightly orchestrated events in which IL-10 plays a central role and disruption of these processes can contribute to the manifestation and/or exacerbation of a chronic inflammatory disorder, such as RA. Current studies on regulatory mechanisms of TNF-α production are predominantly performed using LPS-stimulated macrophages. Such model systems have proved invaluable in understanding the pathways involved in TNF-α production and regulation, but are not relevant to those mechanisms that drive TNF-α production at sites of chronic inflammation where other triggers are involved. Previously, we have reported that spontaneous TNF-α production by RA synovial MNC is largely T cell contact dependent (12), and, although we have identified several cell surface ligands that are potentially involved in this trigger, the mechanism involved remains elusive (19). Utilizing one of the models of T cell activation (cross-linked anti-CD3), we have noted that macrophages cocultured with these cells produce an abundance of TNF-α over a 24-h time frame (12). In this study, we have compared the regulation of TNF-α by the master anti-inflammatory cytokine IL-10 in conventional LPS-stimulated macrophages with macrophages cocultured with anti-CD3–activated T cells (Ttcr). We find that IL-10 uses distinct mechanisms to regulate TNF production, which is dependent upon the stimulus used to activate the macrophage. Thus, IL-10 regulation of TNF-α in LPS, but not in T cell-activated macrophages, is strongly STAT3 dependent. Furthermore, this rapid induction of TNF-α in LPS-stimulated macrophages is dependent upon the involvement of a NF-κB binding site within the enhancer region downstream of tnf 3′-UTR. In contrast, this element is not used in macrophages activated by contact with T cells where stimulation results in a slow, but continuous increase in TNF-α. Additionally, we found that exogenous IL-10 failed to suppress TNF-α production during the initial 8 h of coculture. This attenuation of the inhibitory capacity of IL-10 may relate to a dysregulation in its ability to signal via STAT3. In both LPS-stimulated macrophages and macrophages cocultured with Ttcr, STAT3 is phosphorylated and functionally active (Fig. 3). However, in the presence of exogenous IL-10, LPS induces a synergistic increase in STAT3 transcriptional activity that is not observed in T cell/macrophage cocultures. This absence of synergistic STAT3 transcriptional activity may account for the inability of exogenous IL-10 to inhibit TNF-α production by T cell/macrophage cocultures. To date, in the human system there are no conclusive data to show that IL-10–mediated gene silencing requires the transcription of IL-10–inducible genes especially during the early phase of stimulation. It is possible that these IL-10–inducible genes are required for effective IL-10–mediated suppression of TNF-α and may account for the poor response to IL-10 during the first 8 h of coculture. Alternatively, the attenuated inhibitory effects of IL-10 may relate to its dependence on NF-κB. Our group has recently shown that TNF-α production by LPS-stimulated macrophages is strongly dependent on a 250-bp enhancer region outside its 3′-UTR (enhancer region). This region also contains an IL-10–responsive element, which encompasses a fourth κB site (25). Interestingly, this enhancer region only regulates the first hour of transcriptional activity and does not participate in TNF-α production by T cell/macrophage cocultures at later time points (Fig. 2E). Therefore, it is possible that a lack of sustained enhancer region activity may account for the attenuation of the inhibitory activity of IL-10 during the first 8 h of coculture. Alternatively, it is possible that other factor(s) is recruited to this region within the initial hour of T cell/macrophage coculture, which deactivates the 3′ tnf enhancer region and/or the structure of tnf gene is modified during the initial hour to conceal the site from the cells’ transcriptional machinery. Consequently, both the kinetics of TNF-α production as well as its regulation by IL-10 is altered due to a lack of utilization of the IL-10–sensitive element contained within the 3′-enhancer region. Interestingly, endogenously produced IL-10 is capable of suppressing TNF-α production by T cell/macrophage cocultures as its neutralization caused a significant increase in TNF-α levels (Fig. 3B). However, blockade of STAT3 by siRNA knockdown of STAT3 or overexpression of a dominant-negative form of STAT3 (Fig. 4C, 4D) did not enhance TNF-α production in these T cell/macrophage cocultures, in sharp contrast to that observed in LPS-stimulated macrophages (Fig. 3A, 3B). Likewise, inhibition of spontaneous TNF-α production by endogenous IL-10 in RA synovial tissue MNCs was also not enhanced when STAT3 was blocked (Fig. 5A). This strongly suggests that a STAT3-dependent mechanism is not used by endogenous IL-10 in regulating TNF-α production in macrophages activated by T cells, or in RA synovial macrophages. Although it is widely acknowledged that STAT3 is the dominant mediator of the anti-inflammatory effects of IL-10, we observed in a previous study that, even in LPS-stimulated macrophages, a time interval exists (within the first hour of stimulation) where blockade of TNF-α mRNA by IL-10 was not modulated by STAT3 inhibition (27). Relatively little is known regarding which signaling pathways other than PI3K are activated by IL-10 in macrophages. However, we observed using pharmacological inhibitors (31) that blockade of PI3K had no effect upon the inhibitory effect of IL-10 on TNF-α or IL-6 production. These observations suggest that IL-10 must activate alternate signaling pathways distinct from STAT3 in these cells, although the precise identity of these alternate pathways remains to be elucidated. We previously observed that the T cell/macrophage cell-cell contact model (12, 32) could use both fixed (nonautologous) and nonfixed (autologous) T cells. Thus, it was of interest in this current study to note that when macrophages were stimulated with fixed T cells, the kinetics of TNF-α protein production mirrored that of LPS-stimulated macrophages (Supplemental Fig. 4A). This is largely suggestive that a soluble factor altered the kinetics of TNF-α production. Potential candidates for such an effect are IFN-γ/STAT1/IFN-inducible factors, and, of interest, we showed that blockade of IFN-γ receptor activity in T cell/macrophage cocultures attenuated the continued rise of TNF-α production by macrophages (Supplemental Fig. 4B). We noted that in both LPS stimulated (Supplemental Fig. 4C) and T cell stimulated (Supplemental Fig. 4D), both STAT1 and STAT3 were phosphorylated, as shown by phospho FACS analysis of the macrophage population. However, the activation of STAT1 and STAT3 were synchronized after stimulation with LPS (Supplemental Fig. 4C), whereas in T cell/macrophage cocultures have revealed that STAT1 is activated and its activity peaks within the first hour of coculture (Supplemental Fig. 4D). This is followed by the activation of STAT3 several hours later. Therefore, in the T cell/macrophage cocultures, it is possible that the initial burst of STAT1 activity modifies and redirects subsequent IL-10 signaling events to occur via a STAT3-independent pathway. Although the exact mechanism(s) involved in this process is still not clear, we are confident that they do not involve sequestering of STAT3 by STAT1, as described previously (33), because we did not find evidence for STAT1/STAT3 heterodimers, as determined by immunoprecipitation of STAT3, followed by STAT1 immunoblotting (data not shown). We have noted that the levels of IL-10 produced by T cell/macrophage cocultures (Fig. 4F) and RA synovial MNCs (Fig. 5B) are significantly lower than those induced by stimulation with LPS (Fig. 1B). This suggests that STAT3-dependent mechanism by which IL-10 inhibits the transcription of TNF-α can be concentration dependent. This is supported by the fact that exogenous IL-10 is capable of inhibiting TNF-α production by T cell/macrophage cocultures via a STAT3-dependent pathway, as shown by the reversal of IL-10–mediated inhibition of TNF-α in STAT3-deficient macrophages (Fig. 4C, 4D). Likewise, overexpression of a constitutively active form of STAT3 significantly inhibits TNF-α production by RA synovial tissue MNCs (Fig. 5C). However, exogenous IL-10’s ability to inhibit the TNF-α production in cocultures of T cell/macrophages can be attenuated by increasing the T cell/macrophage ratio (Supplemental Fig. 3B, 3C). Therefore, these data imply that Ttcrs (or a factor produced by Ttcrs) attenuates the ability of IL-10 to inhibit TNF-α production by T cell/macrophage cocultures. These findings highlight the fact that the regulation of TNF-α production by activated macrophages is highly sensitive and dependent upon the number of activated T cells present, the amount of IL-10 produced/available, and the ability of those T cells to bind to the macrophages. Our research highlights the clear differences in mechanisms involved in IL-10–mediated TNF-α regulation between the macrophage-LPS model and T cell/macrophage coculture model. The latter is a more relevant model to investigate how TNF-α is regulated in a chronic inflammatory disease, such as RA. This research has also highlighted the deficiency in our knowledge and understanding of the factors that regulate and participate in IL-10 signaling in macrophages. Clearly, a better understanding of IL-10–induced signaling pathways will provide essential information for developing novel and effective therapies for the treatment of chronic inflammatory disorders such as RA. We thank Dr. Tim Smallie for providing the 5′wt/3′wt and 5′wt/3′mut TNF gene-reporter constructs. We are grateful to Dr. Emily Schmidt and Dr. Jonathan Dean, who critically read the manuscript. This work was supported by a core grant to the Kennedy Institute of Rheumatology Division from Arthritis Research UK.
. 1989. Inhibitory effect of TNF alpha antibodies on synovial cell interleukin-1 production in rheumatoid arthritis. Lancet 2: 244–247.
. 1989. Cytokine production in culture by cells isolated from the synovial membrane. J. Autoimmun. 2: 177–186.
. 1995. Modulation of proinflammatory cytokine release in rheumatoid synovial membrane cell cultures: comparison of monoclonal anti-TNF-alpha antibody with the interleukin-1 receptor antagonist. Eur. Cytokine Netw. 6: 225–230.
. 1993. Treatment of rheumatoid arthritis with chimeric monoclonal antibodies to tumor necrosis factor alpha. Arthritis Rheum. 36: 1681–1690.
. 1994. Randomised double-blind comparison of chimeric monoclonal antibody to tumour necrosis factor alpha (cA2) versus placebo in rheumatoid arthritis. Lancet 344: 1105–1110.
. 1995. The therapeutic effects of an engineered human anti-tumour necrosis factor alpha antibody (CDP571) in rheumatoid arthritis. Br. J. Rheumatol. 34: 334–342.
. 1997. Treatment of rheumatoid arthritis with a recombinant human tumor necrosis factor receptor (p75)-Fc fusion protein. N. Engl. J. Med. 337: 141–147.
. 1997. Anti-tumor necrosis factor-alpha therapy of rheumatoid arthritis. Adv. Immunol. 64: 283–350.
. 1998. Therapeutic efficacy of multiple intravenous infusions of anti-tumor necrosis factor alpha monoclonal antibody combined with low-dose weekly methotrexate in rheumatoid arthritis. Arthritis Rheum. 41: 1552–1563.
. 1999. Anti-tumour necrosis factor specific antibody (infliximab) treatment provides insights into the pathophysiology of rheumatoid arthritis. Ann. Rheum. Dis. 58(Suppl. 1): I56–I60.
. 2010. IRF5 is required for late-phase TNF secretion by human dendritic cells. Blood 115: 4421–4430.
. 2002. Evidence that rheumatoid arthritis synovial T cells are similar to cytokine-activated T cells: involvement of phosphatidylinositol 3-kinase and nuclear factor kappaB pathways in tumor necrosis factor alpha production in rheumatoid arthritis. Arthritis Rheum. 46: 31–41.
. 2004. Increased synovial tissue NF-kappa B1 expression at sites adjacent to the cartilage-pannus junction in rheumatoid arthritis. Arthritis Rheum. 50: 1781–1787.
. 2000. Macrophage-derived cytokine and nuclear factor kappaB p65 expression in synovial membrane and skin of patients with psoriatic arthritis. Arthritis Rheum. 43: 1244–1256.
. 1997. The effect of dexamethasone on the expression of activated NF-kappa B in adjuvant arthritis. Clin. Immunol. Immunopathol. 83: 173–178.
. 2006. The importance of T cell interactions with macrophages in rheumatoid cytokine production. Curr. Top. Microbiol. Immunol. 305: 177–194.
. 1994. Immunoregulatory role of interleukin 10 in rheumatoid arthritis. J. Exp. Med. 179: 1517–1527.
. 2006. Dysregulation of interleukin-10-dependent gene expression in rheumatoid arthritis synovial macrophages. Arthritis Rheum. 54: 2711–2721.
. 2008. Resting CD4+ effector memory T cells are precursors of bystander-activated effectors: a surrogate model of rheumatoid arthritis synovial T-cell function. Arthritis Res. Ther. 10: R36.
. 2004. A novel mechanism for TNF-alpha regulation by p38 MAPK: involvement of NF-kappa B with implications for therapy in rheumatoid arthritis. J. Immunol. 173: 6928–6937.
. 2007. Cutting edge: a transcriptional repressor and corepressor induced by the STAT3-regulated anti-inflammatory signaling pathway. J. Immunol. 179: 7215–7219.
. 2002. Evidence for a dual mechanism for IL-10 suppression of TNF-alpha production that does not involve inhibition of p38 mitogen-activated protein kinase or NF-kappa B in primary human macrophages. J. Immunol. 168: 4837–4845.
. 1991. Interleukin 10 (IL-10) inhibits cytokine synthesis by human monocytes: an autoregulatory role of IL-10 produced by monocytes. J. Exp. Med. 174: 1209–1220.
. 1995. Conserved kappa B element located downstream of the tumor necrosis factor alpha gene: distinct NF-kappa B binding pattern and enhancer activity in LPS activated murine macrophages. Oncogene 11: 97–106.
. 2010. IL-10 inhibits transcription elongation of the human TNF gene in primary macrophages. J. Exp. Med. 207: 2081–2088. 2006. Understanding and exploiting the endogenous interleukin-10/STAT3-mediated anti-inflammatory response. Curr. Opin. Pharmacol. 6: 379–386.
. 2004. Interleukin-10 suppression of myeloid cell activation: a continuing puzzle. Immunology 113: 281–292.
. 2004. Interleukin-10 and related cytokines and receptors. Annu. Rev. Immunol. 22: 929–979.
. 2007. Expression of constitutively active STAT3 can replicate the cytokine-suppressive activity of interleukin-10 in human primary macrophages. J. Biol. Chem. 282: 6965–6975.
. 1999. Interleukin-10 receptor signaling through the JAK-STAT pathway: requirement for two distinct receptor-derived signals for anti-inflammatory action. J. Biol. Chem. 274: 16513–16521.
. 1996. Interleukin-10 stimulation of phosphatidylinositol 3-kinase and p70 S6 kinase is required for the proliferative but not the antiinflammatory effects of the cytokine. J. Biochem. Chem. 271: 16357–16362.
. 2006. T-cell contact-dependent regulation of CC and CXC chemokine production in monocytes through differential involvement of NFkappaB: implications for rheumatoid arthritis. Arthritis Res. Ther. 8: R168.
. 2003. Reprogramming of IL-10 activity and signaling by IFN-gamma. J. Immunol. 171: 5034–5041.